Best Chinese Knives: Ganzo Firebird G759 F759M Knife Review - Not quite Delica! Ganzo Firebird G759 F759M Knife Review - Not quite Delica! I have received this knife along with the G753M1 and want to tell you my thoughts about it. Right off the bet I will say that this knife reminds a lot another knife - the Byrd Meladowark 2 by Spyderco, which itself is somewhat a budget copy of the Spyderco Delica. - The knife came in a Firebird branded box along with a microfiber sleeve. Out of the box it is excellent - razor sharp (along with a thin blade and a sharp angle), no bladeplay, action is smooth, the blade is centered, no F&F issues. - The quality (especially for the price). Almost no issues out of the box (except some uneven sharpening, which can be fixed) is something you can't expect from a ~$10 knife. - The materials (for the price). Nested FRN scales, skeletonized liners and 440C steel are things you also can't expect from a ~$10 knife. - The low weight, bright orange color, ergos (full 4 finger grip), smoothness (out of the box), pocket clip are all excellent (again, for the price). - As you've probably already guessed - the Price. The expression "you can't expect that from a $X knife" was made irrelevant by Ganzo so many times that now you kind of expect them these things for that price and that is just awesome. That, in comparison to other companies that don't even make knives for those prices and their quality is much lower than the Ganzo standard. Don't expect anything from those guys. - The backlock is smooth and functions great, but has a bit of vertical flex to it (like on some genuine Spyderco backlocks). Not a huge issue, but thought I should mention it. - As already mentioned - some uneven sharpening on both sides of the knife. - The blade opens smoothly but could be flicked out only with a wrist flick (because of the backlock and the opening hole). - So now to the elephant in the room - the opening eliptic hole. 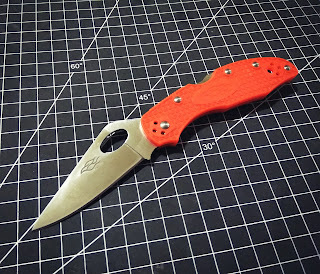 As already being said in the beginning - this knife is a slight adjusted copy of the Meladowark 2, which itself is a slight modified copy of the Spyderco Delica. So it seems that the Ganzo folks wanted to make it a bit different and changed the shape of the opening hole to an elliptic one, that is not very comfortable, makes flicking a blade out possible only with using a wrist and not very appealing. I don't understand why they didn't just make it round/more prolonged/used a thumb stud - any one of those would make a much better choice. - So I seem to be a bit torn about this knife, from one side the awesome value and quality level for the price, from the other the thumb hole issue. I'll say it like this - I appreciate this knife very much, because it dominates the model that it is a copy of and if I had to choose from it or the Byrd (even at the same price) I would choose the G759. However Spyderco Delica would be my choice if those two were sold at the same price (and I wanted it to dominate that as well). 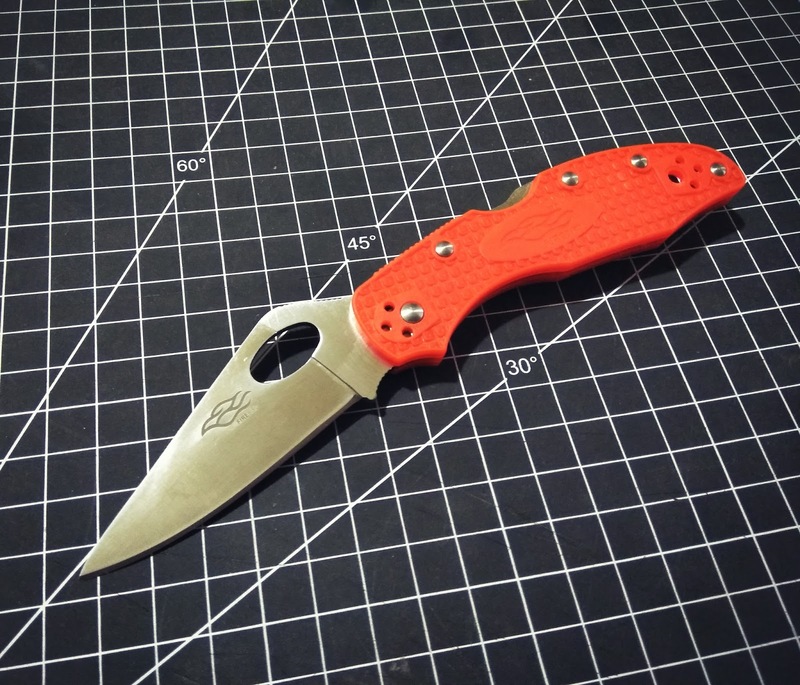 This knife will make an excellent small and very light EDC knife for light cutting tasks that don't require a long blade and if you always wanted to try a Delica, but didn't want to spend that much, this could easily fill the void. Nick Shabazz, is that you? It's his Chinese clone - Nick Chibazz.